Bishop Gary Mueller and Mary Brooke Casad share their hopes for the May gathering of the Aldersgate Covenant. The group's meeting 20 years ago helped lead to the denomination's mission statement. 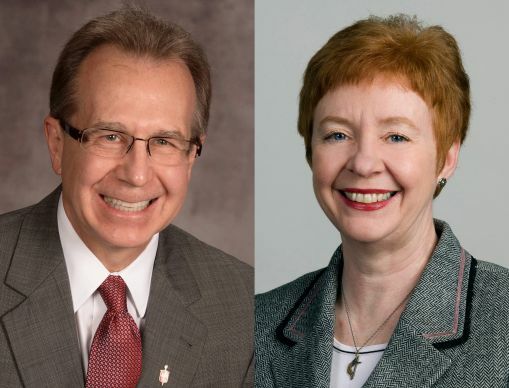 Editor’s note: United Methodists are invited to attend a gathering of the Aldersgate Covenant on May 16-17 at the United Methodist Church of the Resurrection in Leawood, Kan. Mary Brooke Casad and Arkansas Area Bishop Gary Mueller share the background and purpose of this prayer gathering. Twenty years ago, a group of laity and clergy came together to celebrate how the Holy Spirit was at work in The United Methodist Church; to address the loss of membership, resources and confidence in our denomination; and to discern how to engage a world that was increasingly indifferent, even hostile, to the Gospel of Jesus Christ. What: 20 hours of prayer, worship and watching for a revival of the Holy Spirit in our lives and our Church. Where: United Methodist Church of the Resurrection in Leawood, Kan. The initial group met on May 24, 1994 at Perkins School of Theology, Southern Methodist University in Dallas and selected the name “Aldersgate Covenant.” As John Wesley experienced a “heart-warming” experience on May 24, 1738 on Aldersgate Street in London, the group covenanted together to seek spiritual and missional revival for The United Methodist Church. The Dallas-area group quickly connected with other United Methodists from across the country and sponsored gatherings in several locations. Legislation was drafted for a proposed mission statement for The United Methodist Church and endorsed by several annual conferences in their 1995 sessions. The result of these efforts was the 1996 General Conference’s adoption of a mission statement, later amended by the 2008 General Conference, which proclaims, “The mission of the Church is to make disciples of Jesus Christ for the transformation of the world. Local churches provide the most significant arena through which disciple-making occurs.” Paragraphs 120, 121 and 122 of the Book of Discipline were also a part of this original petition. Nearly 20 years later, The United Methodist Church has made great strides of putting the mission of making disciples of Jesus Christ at the forefront of what we do. Yet, at the same time, we are increasingly aware that we are in the midst of a spiritual crisis marked by a world filled with pain, struggle and injustice; of a culture that seems to have little room left for God; and of a church that has lost much of its passion and zeal. Perhaps more importantly, it is our confession that we have tried for too long to rely on ourselves and not on God. In reflecting on this reality, several of the original Aldersgate Covenant leaders concluded that a new way forward is needed. Young adult clergy and lay leaders were invited into a conversation, and the Aldersgate Covenant is stepping forward now because we believe that spiritual revival is the only thing that will carry us into God’s future. As was true 20 years ago, we are a diverse group of laity and clergy seeking revival that will truly enable The United Methodist Church to carry out our mission of making disciples of Jesus Christ for the transformation of the world in bold new ways. We are not associated with any interest group, caucus or organization in the United Methodist Church. So what do we mean by”revival?” Revival is not revivalism, the replication of certain types of experience rooted in the past, an attempt to hide from the rapidly changing world of the 21st century or a movement that seeks to ignore the important work of seeking justice, healing and hope for the millions of people living in poverty, oppression, violence and despair. Revival is the work of the Holy Spirit that deepens our relationship with Jesus Christ, leads to more fruitful discipleship and enables congregations to grow in vitality so they make disciples of Jesus Christ, who in turn make more disciples, equipped to be involved in God’s work of transforming lives, communities and the world. We believe a sign of God’s grace has already been evidenced in the timing of this event. As our church continues to struggle with various viewpoints and interpretations of the issues of our day, anxiety runs deep throughout our connection. The opportunity to gather and pray for our church’s spiritual revival is indeed timely and — perhaps more than any other time in recent years — absolutely necessary. On May 16-17, we will gather for worship, prayer and conversation. We will gather for a Service of Covenant Renewal and celebration of Holy Communion. We will gather because we love God’s Church and want to be faithful disciples of Jesus Christ. Won’t you come join the gathering with us? *Mueller is the bishop of the Arkansas Annual (regional) Conference, and Casad is a former executive secretary of the United Methodist Connectional Table. Both serve on the gathering’s steering team.